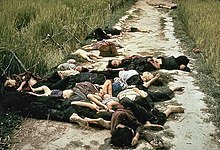 The Mỹ Lai Massacre (Vietnamese: thảm sát Mỹ Lai [tʰɐ̃ːm ʂɐ̌ːt mǐˀ lɐːj], [mǐˀlɐːj] ( listen)) wis the Vietnam War mass killin o atween 347 an 504 unairmed ceevilians in Sooth Vietnam on Mairch 16, 1968. It wis committit bi U.S. Airmy sodgers frae Company C, 1st Battalion, 20t Infantry Regiment, 11t Brigade, 23rd (Americal) Infantry Diveesion. Victims includit men, weemen, bairns, an infants. Some o the weemen war gang-raped an thair bouks mutilatit. Twinty-sax sodgers war chairged wi creeminal offenses, but anly Lieutenant William Calley Jr., a platoon leader in C Company, wis convictit. Foond guilty o killin 22 villagers, he wis oreeginally gien a life sentence, but served anly three an a hauf years unner hoose arrest. ↑ Murder in the name of war: My Lai. BBC News, July 20, 1998.